On the Podium at the European Championships: Geronimo! Those of you who are following the progress of our young windsurfers in the US have heard of the Nores brothers from Miami. Big brother Maximo, the reigning Techno 293 North American champion, is turning 16 this year and will represent the USA at the Youth Olympic Games in China. Younger brother Geronimo is 14 now and was making headlines long before he turned his attention to windsurfing when he claimed three World titles in a row in the O’pen Bic class in 2010-12. And yes, there’s a third Nores brother, Manu, who is doing much more than waiting in the wings of his two older brothers, and starting to make waves of his own. Those three have been on a whirlwind adventure of late, traveling from Cancun, Mexico to Mendoza, Argentina along with their US teammates to hone their skills, posting great results along the way against the best from the Americas. 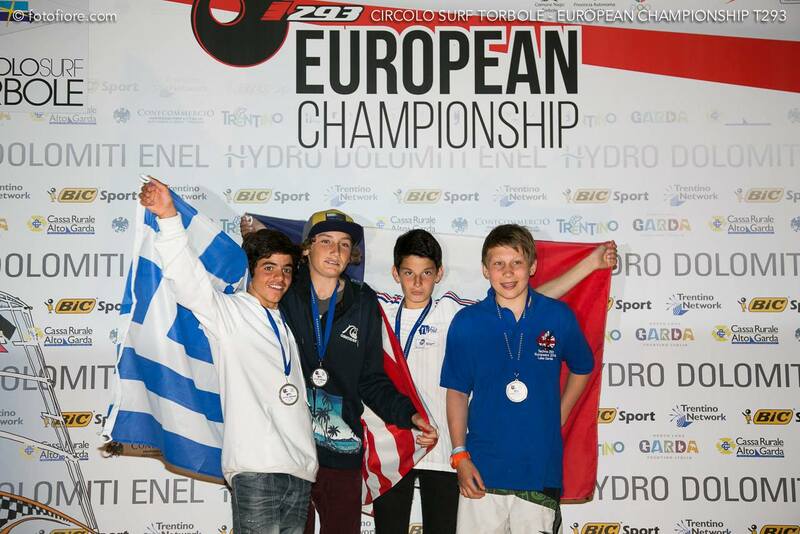 The April 18-20 US Nationals in Miami gave them all a chance to catch their breath with a home-based event, but the break was short-lived: immediately after the awards ceremony at the Nationals, they hopped on a flight to Italy with their Miami teammate Steven Cramer to take part in the 2014 Techno 293 European Championships. A few hours after landing in Milan, they found themselves in a flash mob of 313 jubilant youngsters waving flags through the streets of Torbole! “My heart is racing, there are people all around me, all with the same goal, to win. The start horn goes off and everybody is pumping away at the start, some left behind and others launched ahead. Racing in international events, to me are the highlights of my whole year. There is just so much to learn with so many people around you and it’s an amazing experience. 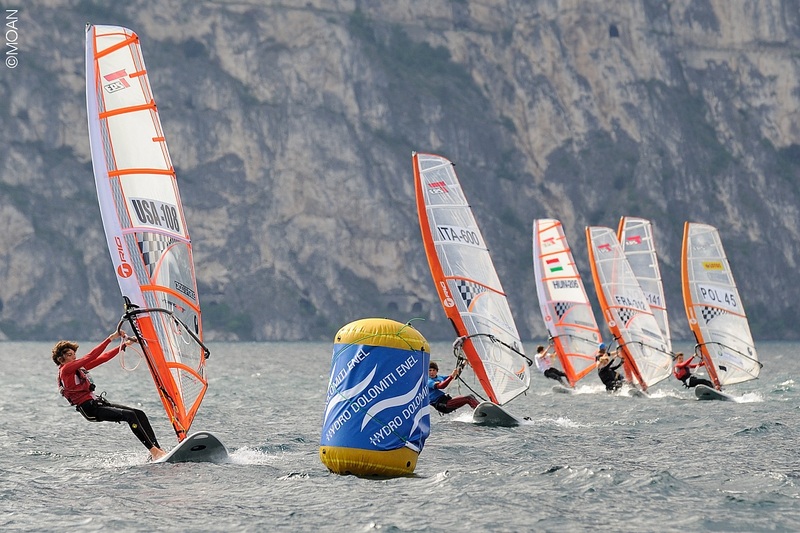 The T293 2014 Europeans in Garda was definitely one of my favorite windsurfing events I’ve ever been to. It was so well organized and full of fair racing and fierce competition. I can honestly say I’ve never pumped so hard and so much in my life. I had an amazing time, both on and off the water. With over 300 competitors, friends were everywhere to be found. 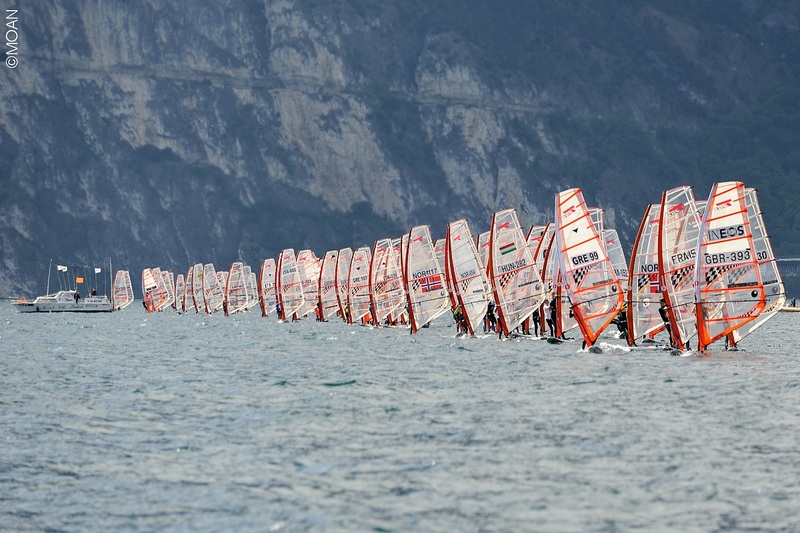 The venue of this European championship was amazing because Garda delivered amazing racing conditions every day, and Torbole was a beautiful town. The event was the biggest of the European championships in history of the T293 class which is definitely a positive sign. People are becoming involved at younger ages like 11 and 12 and the class is growing in all fleets of all ages. We expect over 500 people at worlds making T293 the biggest youth windsurfing class and, in the opinion of many others and mine as well, the best. I was proud to represent my country and thrilled to get a second place and stand on that podium. “The Miami Yacht Club Youth Sailing is extremely proud of their windsurfing racing team. They have had a year of great accomplishments all over the globe. This, of course, is thanks to the great efforts of the coaches who work with them, the parents who make sure they can travel and experience these unforgettable life opportunities, and the sailors who put forth the effort and the hours of training! We are very happy to be able to support our team. Their successes have created an awakening to the sport of windsurfing for young kids around the area. We have been offering windsurfing for the past three years in our summer camp programs. I find myself as Director of YSF programs speaking to more and more parents and creating more classes and private classes. Also I speak to parents of sailors looking to add windsurfing to their sailing activities. Congratulations to Geronimo, Maximo, Papa Nores, Miami YC, and all the others involved. I remember first meeting the Nores at Vineyard Haven YC and again at Chatham YC at T293 events. I am so glad for the total success as Miami YC has set the example for the future…..sail a dinghy and windsurf from the first moments. Bravo. Awesome. Next story US Windsurfing Nationals Get Amped Up!